Had a great day on Sunday de-funking the decks. That winter sludge is some nasty and persistent stuff. A day of scrubbing is required to bring her back to life. I'm about 90% satisfied with the deck, although I still have a few areas where gel coat porosity makes funk removal stubborn. The good news is, I removed enough that I was able to wash the hull without fear of deck wash bringing new filth to the clean topsides. I noticed that I need to rub out a few abrasions on the port side where my fenders rubbed some gunk into the paint. That should only take an hour or so. I also have to take a bit more aggressive matters to get the black streaks off. Then I'm ready to put the AwlCare in, which is a pleasure compared to traditional wax. 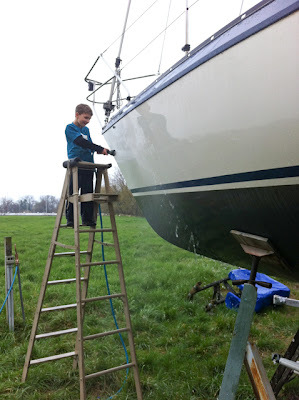 Duncan was a great help as always and had a blast rinsing the hull as I washed each section. If luck favors me this week I'll be able to get out two nights after dinner and finish up the polishing. Then all that's left on the critical list is de-winterizing the engine.